12th April 2014, Venue – Indian Social Institute, Lodhi Road, New Delhi. Article compiled by Ms.Atiya Hajee and Ms.Andesha, with courtesy of NAD. Mr Javid Abidi - address through video with ISL interpretation. Mr Abidi stated the condition of the disabled in India post Independence. With no laws the disabled were marginalized at all times and everywhere. Things began to move with the 1995 PWD ACT, however this was mostly on paper. In time due to the hard work of DRG, NCEDP India ratified the UNCRPD in 2007. 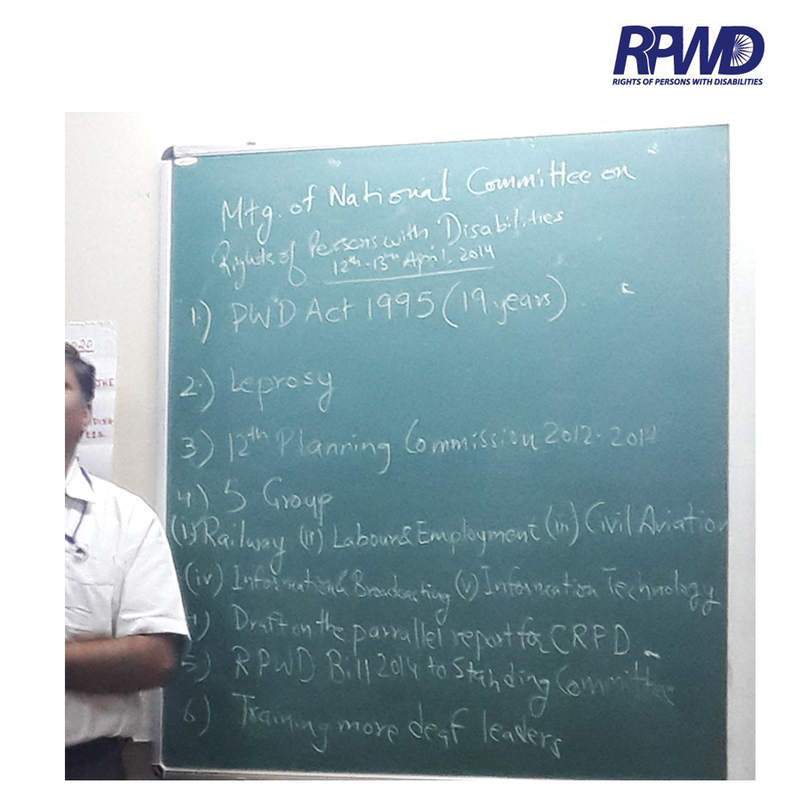 Again DRG and NCEDP worked diligently and asked the government to draft a new law which in 2011 culminated in the RPWD Bill. The 1995 PWD Act recognized only physical disabilities. However the RPWD Bill recognized mental disabilities also and provided rights for people with mental disabilities for the very first time in India. 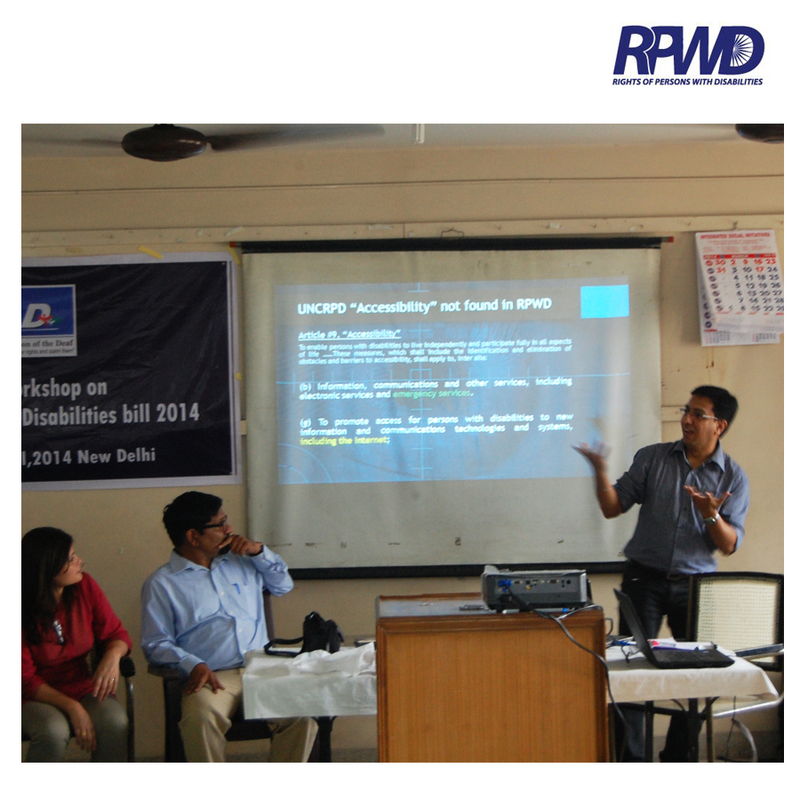 Many disability groups looked at the RPWD bill with only their personal interests in mind and opposed the Bill. This resulted in divisions in the Disability community, difference of opinion, created doubts in the minds of many and today it is at the standing committee awaiting the approval after a new government is formed. 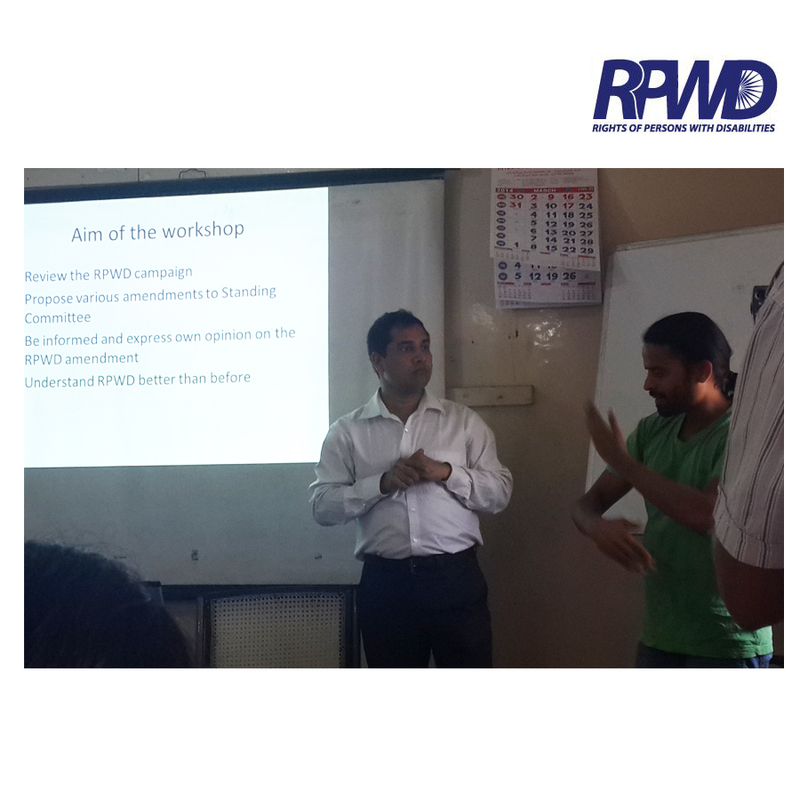 The RPWD bill 2013 has so many benefits even for the deaf. Section 41 on access to information and communication technology says that the government should ensure that persons with disabilities have access to electronic media by providing sign language interpretation and close captioning. Sections 15 and 16 also ensure that education to the deaf is provided in the most appropriate means of communication and that teachers should be trained in sign language. Therefore, this bill had many positive points. We are going to keep fighting now to get this bill passed in the parliament. Dr Madan Vasishta address through Video. The PwD act of 1995 was not very powerful and did not have many benefits. I hope the RPWD bill gets passes in the parliament. I had a discussion with a deaf lawyer here about the RPWD bill. He said there are a number of good points. The most important thing to remember is to have access for Deaf. With the above mentioned services and access to information, communication every Deaf individual can be an active and equal citizen of any country. If Dr Madan Vasishta did not have access to sign language interpreter services he would not have been able to complete his Phd, he would not have been able to head educational institutions in America. The same needs to happed in India too. Education is very important. Deaf need education to get jobs. There should be schools and colleges so that the deaf can study, and get degrees and jobs. In America, the Americans with Disabilities Act was passes in 1990 which had provisions for interpreters, close captioning, etc. The deaf benefitted from the provision of these services and were able to develop. Today here in America, we have deaf professors, teachers, actors, lawyers, doctors, etc. A deaf person has access to all services and can do whatever they want to do and develop. Technology like VRS, close captioning, etc. 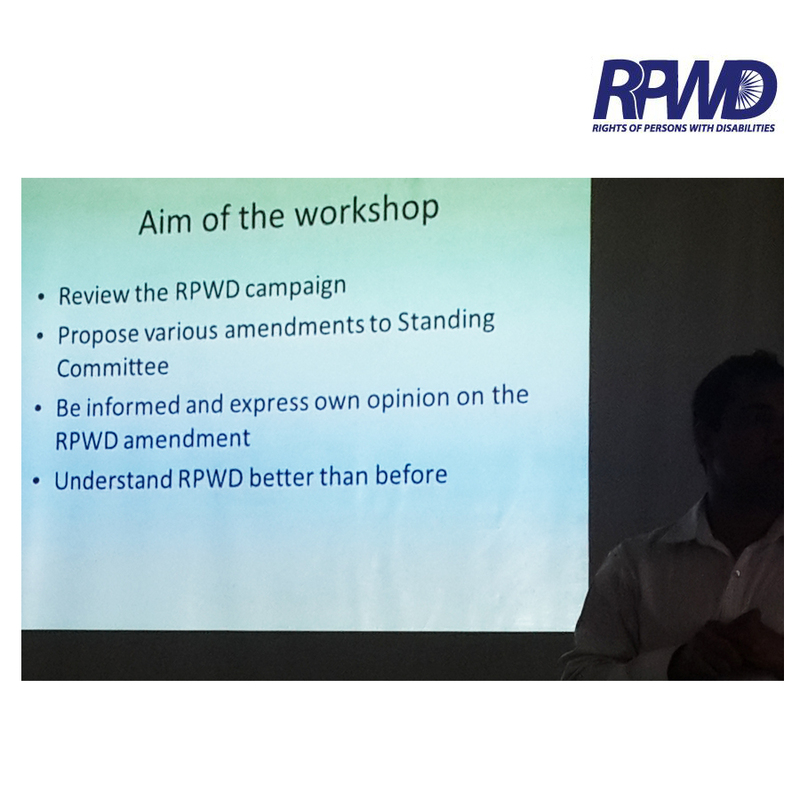 Further more after a scrutinizing the RPWD Bill and comparing it with the UNCRPD the following aspects came to light. The UNCRPD defines “languages” to include signed languages but the RPWD 2013 version does not include signed languages. The definition of languages should be included in RPWD. The UNCRPD defines “freedom of speech” very clearly and includes sign languages and augmentative and augmentative communication (AAC). But the RPWD 2012 version’s definition of “freedom of speech” is very narrow and does not include sign languages and AAC. The definition of AAC in RWPD is also very limited. 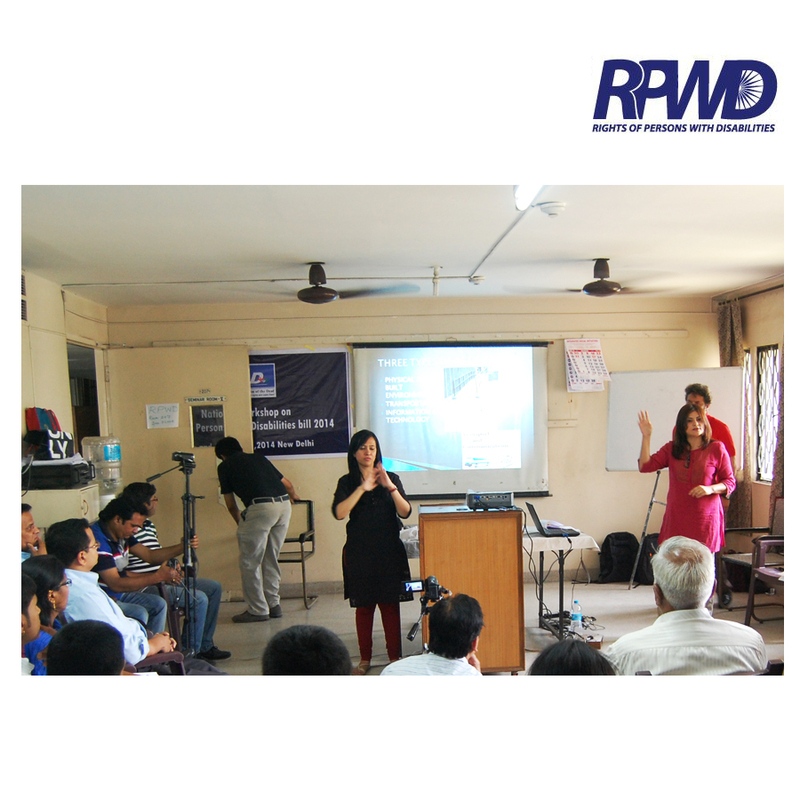 For access to information and communication technology, the RPWD draft 2012 version was more elaborate and detailed. The 2013 version does not have many of the points included in the 2012 version. The UNCRPD has a separate article on accessibility which is not there in RPWD. The UNCRPD provisions for research and development and assistive technologies in article 4 are also missing from the RPWD. On participation in cultural life, recreation, leisure and sport, the UNCRPD article is detailed and clear. But the RPWD is not specific on which kind of accessibility. Also, UNCRPD’s article 30 clearly recognizes sign languages and deaf culture. But RWPD does not. 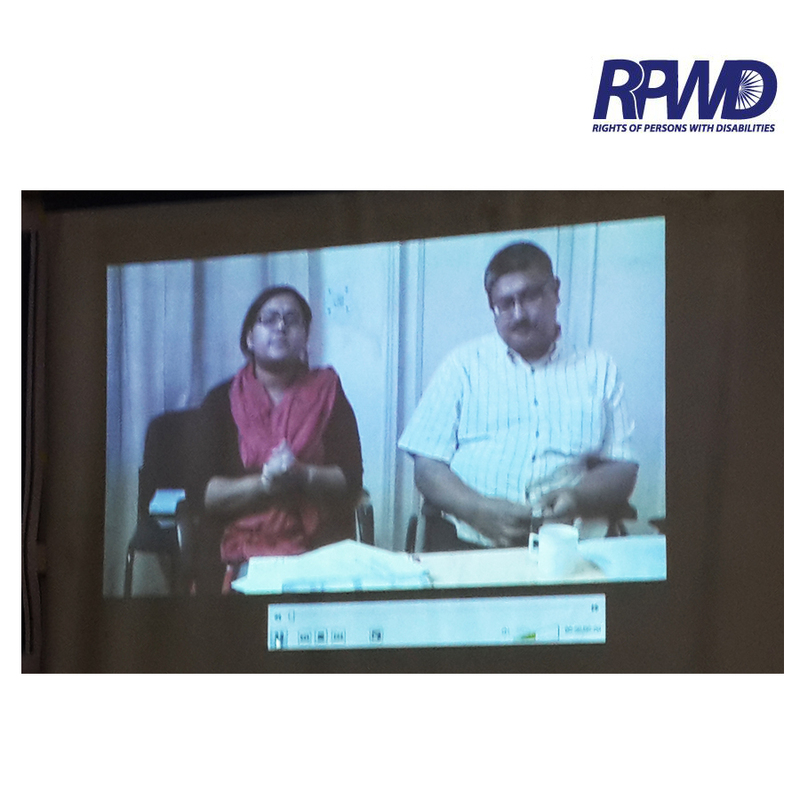 For accessibility, both UNCRPD and RPWD 2012 mention interpreters and close captioning. 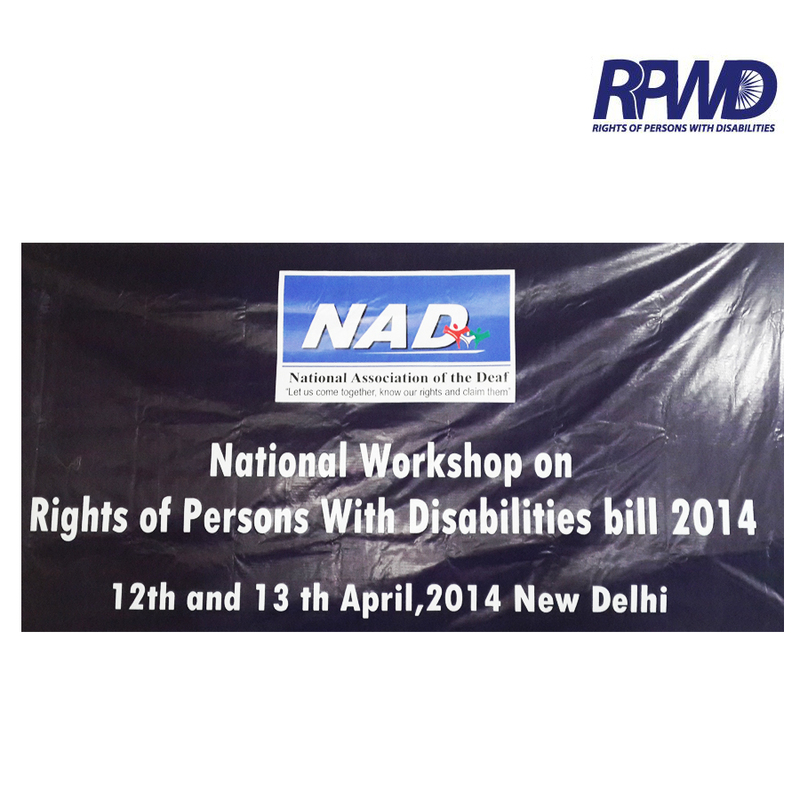 The RPWD draft 2012 has a section on personal mobility, which is one good point in RPWD that is missing in UNCRPD. There are many benefits for the deaf from the current provisions due to the emphasis on use of technology for information. Mr Gyananda Purohit focused on the rural development and accessibility issues. Parents in rural areas are hesitant to send their children to schools and hostels in cities that are far. The Sarva Shiksha Abhiyan (SSA) guarantees education for all. But deaf students are put in hearing schools where teachers don’t know sign language. It is better to have deaf people as teachers to teach deaf students. The SSA provides for special schools for children with disabilities. But here also, the completely deaf and blind are refused admission. Only children with low vision or who are hard of hearing are accepted. So this is a problem. But now under MRC, deaf also get reservation. In MP, there is a department called GAD which can be questioned if the deaf are not given jobs. Unemployed deaf are given an unemployment allowance. Misuse of Laws by non disabled people for personal benefits by issuance of disability certificates through incorrect means is high. The RPWD Bill needs to be more specific and clear if it aims at working towards providing Rights to Persons with Disabilities. At the same time the disabled communities , the Deaf need to educate themselves with the laws so that they can question the authorities if they are being discriminated. Renting of apartments, accessibility in communication , information for Deaf in prison, hostels, hotels etc has still not been looked into. The isolated deaf in rural areas are not even fluent sign language users to protect their rights one needs to reach out to them as well. UNCRPD emphasizes on communication. Communication is a two-way process between a speaker and a hearer. Language is the foundation of communication. Communication can be in many forms – writing, speaking, signing, etc. The deaf have been excluded from life, they have been isolated and have no access to information in the hearing world. UNCRPD acknowledges that communication systems can be of many varieties. Most events and programs on deaf celebration days gift hearing aids to the deaf children. But hearing aids are not the complete solution. Example, when there is thunder, hearing aids can hurt the ear. We need to ask ourselves what do we need. How do we see ourselves? Do we see ourselves as someone who needs hearing aids? With sign language, we can have communication access. And with communication access, we can access justice, health, science and technology, media, etc. and most importantly with sign language we can access education. National Curriculum Framework 2005 (NCF) says that according to law, sign language and braille should be used in schools and teachers should be trained in ISL. The disability issue here comes under the concept of inclusive education. The NCF text books have one page on ISL which is not enough. NCERT keeps changing the curriculum. It becomes difficult to keep up with the changes and adapt the books in Braille or in Sign Language. Again Deaf children are being mainstreamed and it’s a major task to reach out to the teachers of mainstream education. The special educators of the Deaf are not very open to learning Sign Language. So do you think that RPWD can change the situation? Can it bring sign language into schools? The law should clearly say what sign language means – that it has a grammar. Just saying that it is a language is not enough. We should not see ourselves as a disabled people. We should see ourselves as a community speaking a different language. If the government gives funds to develop textbooks and other material in the minority languages and also protects these languages, then the government should also protect ISL and develop material in ISL. How do we teach deaf children? The Deaf way of teaching relates to Deaf culture and sign language. 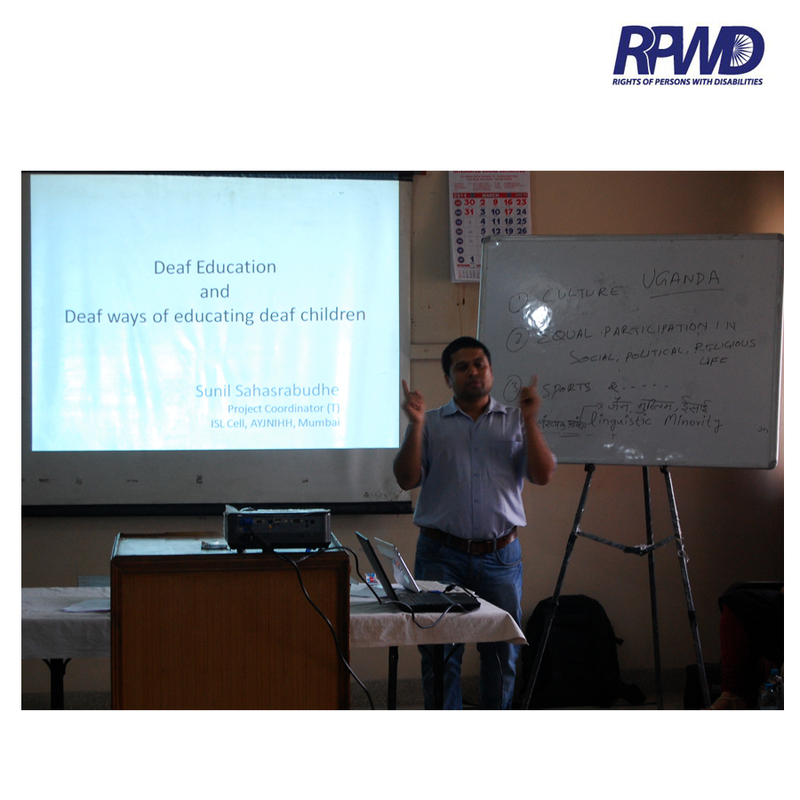 Javed Abidi stated that the 2012 RPWD for deaf education mentions sign language however Sunil disagrees. Just knowledge of sign language for teachers is not enough. Sign language is included in AAC but only sign language is not important. The most important key in Deaf Education is Sign Bilingual Education for the Deaf. Oralism per se is fine but should not be taught in schools or be the main focus in schools. Sign language plus reading and writing, developing literacy of Deaf children is important. Teachers need to have subject knowledge and clear concepts, the skills to convey these in sign language to deaf children. The 1995 PwD act had provisions for special schools. 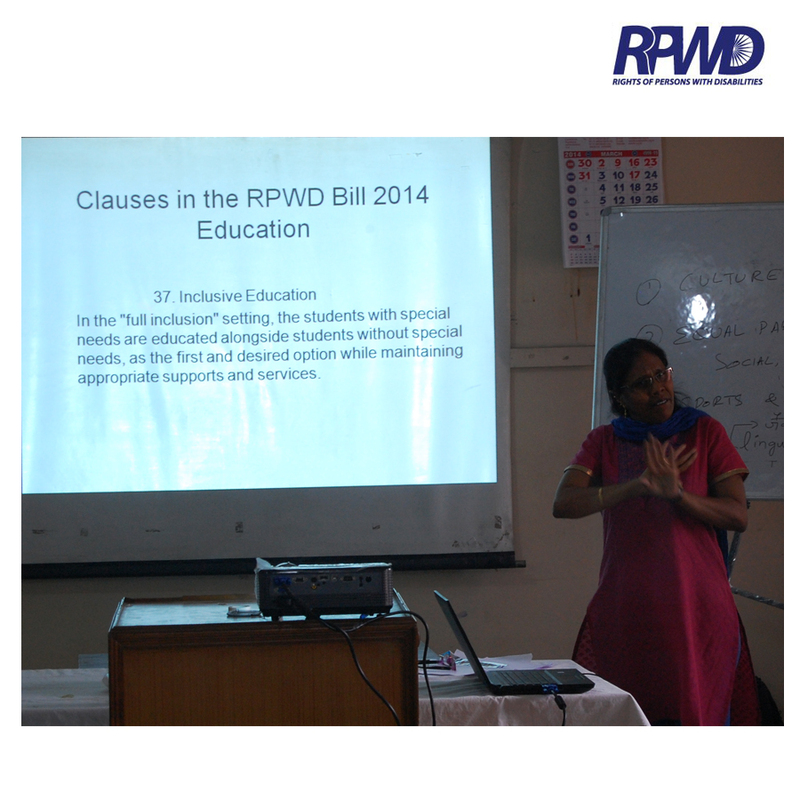 However looking at the RPWD Bill the emphasize is on inclusive education. Inclusive education may work well for children with other disabilities, however it is not suitable for deaf children, it does not work as effectively as it has been thought to be. In a classroom, an interpreter alone is not enough. For deaf children, we need deaf schools where a Deaf child will understand the Deaf culture, his identity with the community, learn, use and excel in his language – sign language. 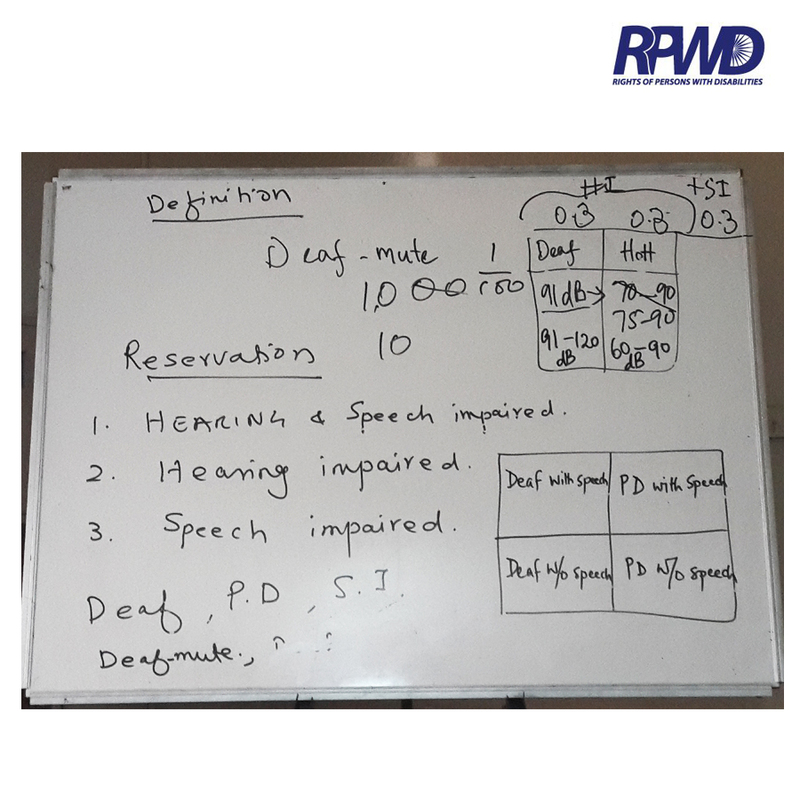 The RPWD also encourages higher education but does not mention interpreters in colleges. Interpreters are necessary for higher education of the deaf. As a teacher of the Deaf for many years Dr Randhawa realized that teaching Deaf children through Oralism was not a total success. Children failed to learn, and ironically they had a separate way of communicating among themselves and understood each other very well through sign language. However the B.Ed Special Education (HI) course does not even mention sign language as an option for communicating with Deaf. Around 50% deaf are oral and have no experience and knowledge of sign language and deaf culture, therefore it is hard to give proof to the government of deaf community, deaf culture and sign language. The RPWD talks about inclusive education, but government schools are in a very poor condition with little infrastructure and material. This poses a major problem. The PwD Act had many provisions, however there was not enough awareness among parents and teacher of Deaf of these provisions. 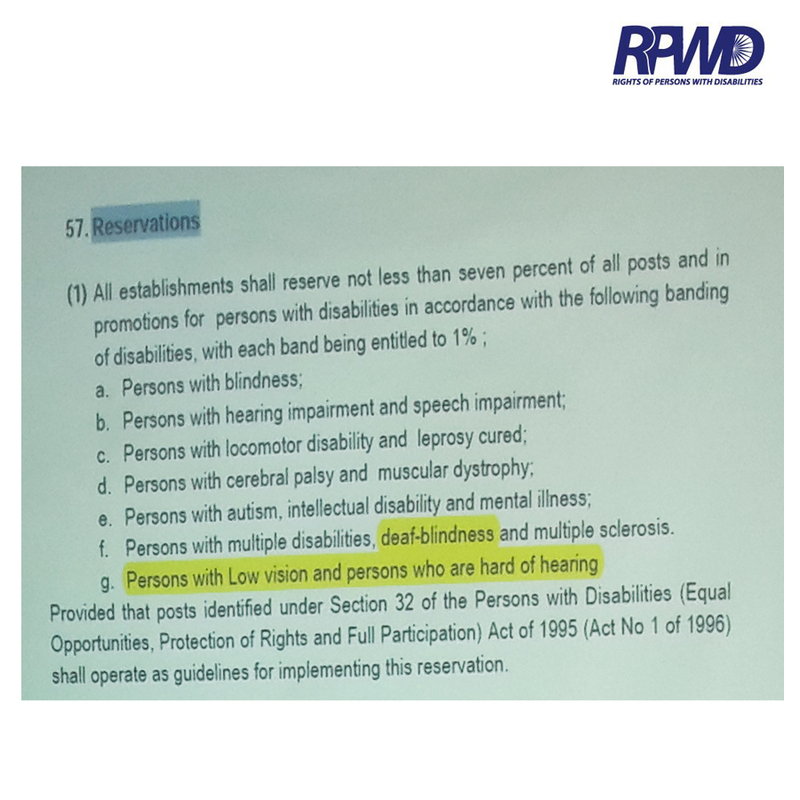 Close scrutiny of the UNCRPD and RPWD Bill the following observations were made. UNCRPD ensures secondary and tertiary education for people with disabilities. But the RPWD does not touch this topic in the same way. Chapter 3 of RPWD Bill on education mentions building accessibility but not communication accessibility. It also mentions monitoring of attainment levels but the reality would be different. Deaf children attend schools but there is very little learning taking place. Who would be accountable for this? Both special education and inclusive education for the deaf have failed for various reasons. In special schools spoken language is used but the requirement is sign language. In inclusive set-ups, teachers are given only a few days training which is not enough. Point 5 acknowledges the special needs of deaf and blind but only says that education of the persons who are blind or deaf or both should be imparted in the most appropriate language and modes and means of communication. Here there is only a reference to the specific needs but there is no clarity about those specific needs and it does not mention the need for use of sign language or special schooling if needed. Clause 16 (g) mentions assistive devices but hearing aids are not very useful in a noisy environment. There is no mention of instructional material in ISL or support services in the form of interpreters. Section 17 is about adult education, however we need to talk about secondary, tertiary and pri primary education. There needs to be clarity in the provisions and choices. Chapter 4 on skill development and chapter 5 on social security and health also, there needs to be specific mention of interpreters. The Americans with Disabilities Act has a separate chapter on telecommunication services for the deaf. The Individual Disabilities Education Act in US also mentions TTY services. The Right to Education Act 2009 also focusses on the age group 6-14 years and ignores the crucial early years from 0-6 years and higher education which are very important. In chapter 8 on duties of the government, points 39, 40 and 41 also need to mention sign language’s benefit for the deaf. Point 46 on human resource development should add interpreters. Chapter 2 on ethics is good and important as deaf themselves can become members of ethics committee to safeguard research ethics while working with deaf communities or sign language. Currently, research grants are given to hearing researchers and there is little involvement of the deaf, and they are not aware of the research taking place. 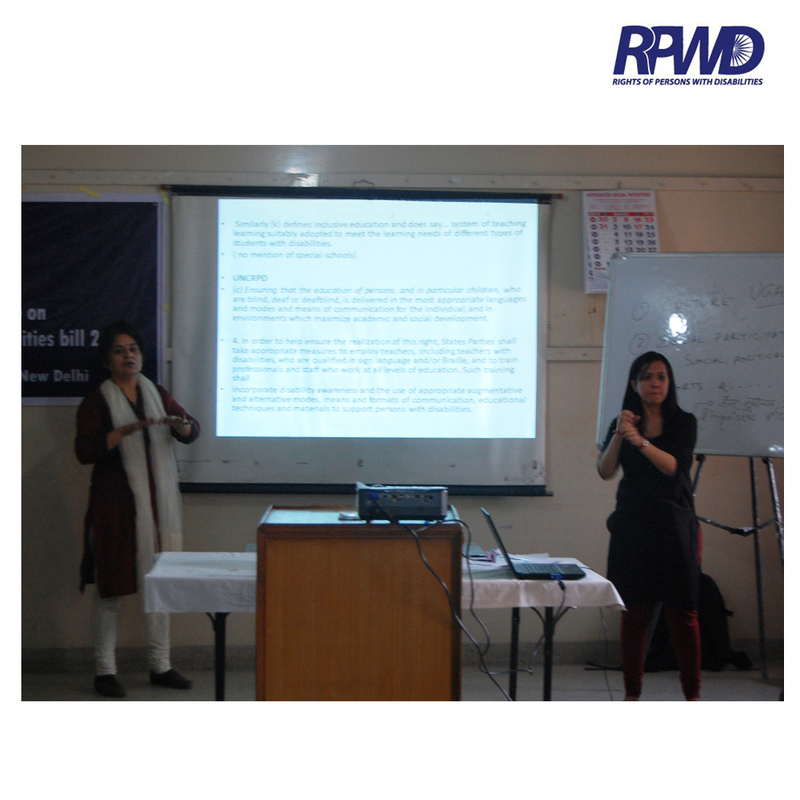 Section 37 on education in RPWD 2011 talks about inclusive education. The section implies that teachers would be trained in ISL and that there would also be professional interpreters for educational purposes available in the classroom. The clauses talking about education to blind and deaf children in the most appropriate means of communication for them should specify braille and sign language. Another addition could be to make necessary adjustments such as IEPs (Indivualized Education Program) as mentioned in the Americans with Disabilities Act 1990. There need to be measures to ensure that the clauses are implemented and programs to teach and train teachers of deaf should be in place and they should be effective. There also needs to be an emphasis on interpreter training, license for interpreters, and a revised syllabus/course in the sign language interpreting course. In India, the possibility of employment is linked to hearing loss levels. The terms used in India – Hearing Impaired and Hearing Handicapped – are not used internationally now since they focus on the loss. The term “Hearing disabled” is used internationally. Hearing impairment (HI) and speech impairment (SI) are different and not related to each other. SI is not related to hearing loss. Comparing the PwD 1995 and the various versions of the RPWD with regard to definitions and reservations for jobs. The definitions in the 2011 version were simple and clear. The 2012 version added a new category of speech and language disability. For reservations for jobs, there is 1% reservation for HI and SI in the 2013 version. Here the meaning of “and” is not clear. In the 1995 act, the term was just HI which was clear but the RPWD versions’ terms are complex and confusing. Do you want that there should be a division between HI and HOH? If yes, why? Are the terms HI and deaf same or different? We need to identify jobs that are suitable for deaf and HOH. 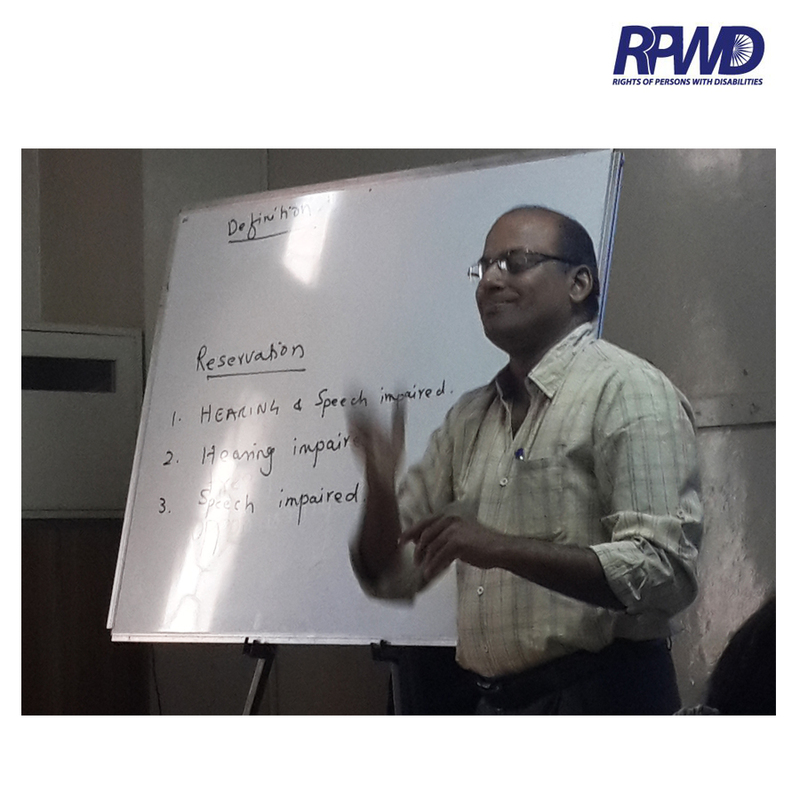 Sujit ended his session by stating we need to accept the diversity of hearing loss and call all deaf.